Chef Andre takes a lot of his cooking inspiration from his French roots but this colourful and exotic dish was inspired by a recent trip he made to Brazil. 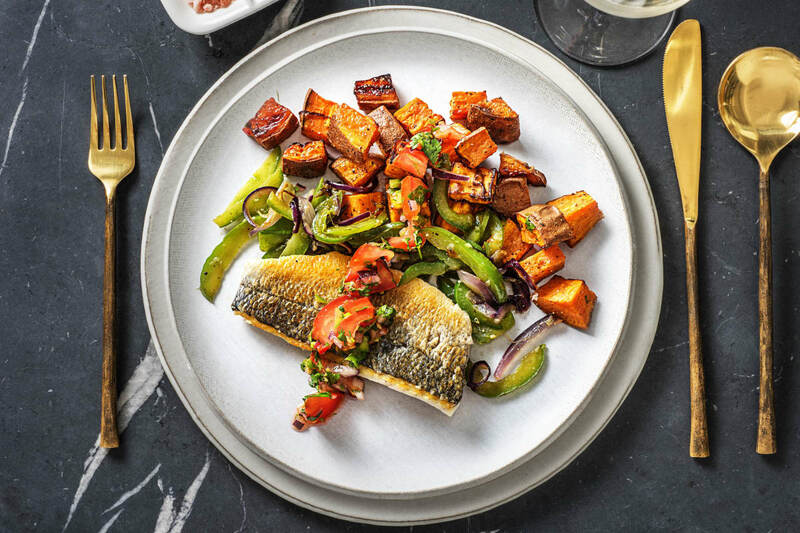 In this bright and beautifully flavoured recipe, crispy skinned sea bass is served alongside roasted sweet potato, juicy green peppers and finished with a zesty salsa. Pair with a crisp Italian white wine like Greco Di Tufo and you’re onto a weeknight winner! Preheat your oven to 200°C. 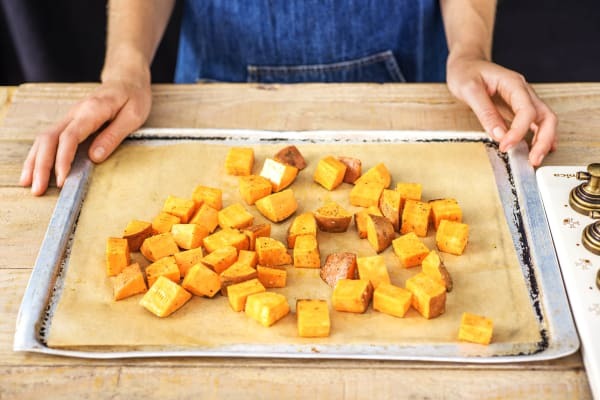 Cut the sweet potato into 2cm chunks (no need to peel). Pop them on a baking tray and drizzle over a splash of oil. Season with a pinch of salt and toss well. Roast in your oven for 25 mins, turn halfway through cooking. Chop the vine tomato into small chunks. Pop in a bowl and season with a pinch of salt and mix well. Halve and peel the red onion. 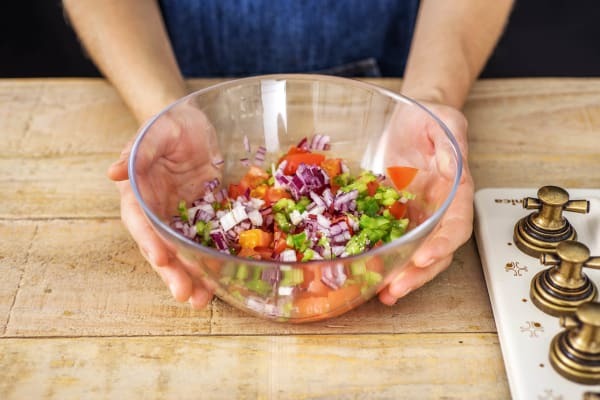 Chop one half into small chunks and add to the tomatoes. Slice the other half into thin half moons. Remove the core from the green pepper and then slice as thinly as you can. Take a quarter of these slices and chop into small cubes. Add to the salsa. Roughly chop the coriander (stalks and all), zest the lime and add both to your salsa. Squeeze in the lime juice and stir in the in olive oil (see ingredients for amount). Halve the chilli length ways, de-seed and thinly slice. Add a pinch to start with, taste and keep adding until you have the required level of heat. Keep the salsa to one side. Peel and grate the garlic (or use a garlic press). 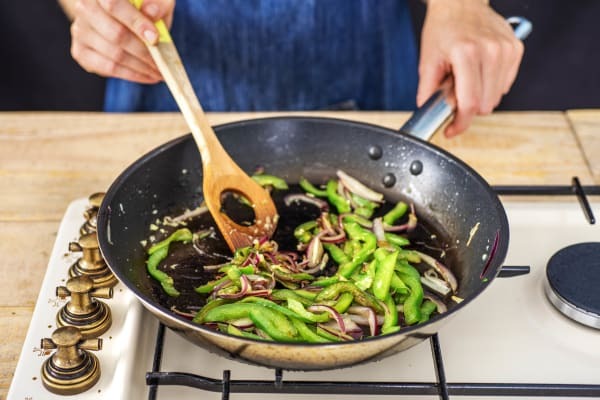 Heat a frying pan on medium-high heat and add a splash of oil. When the oil is hot, add the red onion and green pepper slices. Cook, stirring frequently until soft, 5 mins. Lower the heat to medium and then add the garlic. Cook for 1 minute more and transfer to a plate, we will re-heat them later. 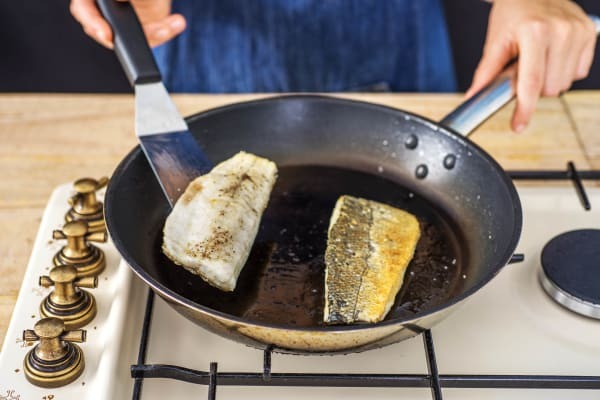 Wipe the pan out with kitchen paper and prepare to cook the sea bass. Heat a splash of oil in the (now empty) frying pan on high heat. Season the fish with salt and pepper on both sides. Carefully, add the bass to the pan skin-side down and leave to cook for 3 mins. Tip: The edges of the fish will begin to brown to let you know that the skin is beginning to crisp up! After 3 mins, carefully turn and cook for another 2-3 mins. IMPORTANT: The fish is cooked when the centre is opaque. 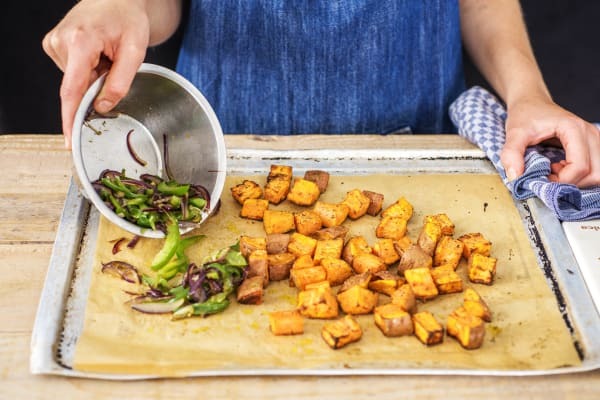 Meanwhile, add the stir fried veggies to your sweet potato tray and warm through for 2 mins. When everything is ready, share the sweet potatoes between your plates in one layer. Nestle the peppers and onions in between and top with your crisp sea bass fillet (skin side up!). 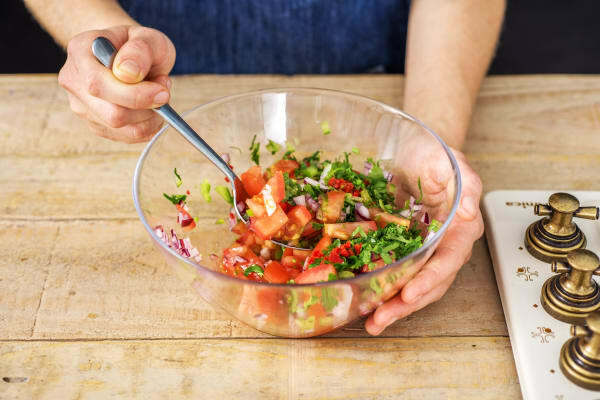 Spoon the salsa around, making sure to drizzle over the zesty juices. Serve immediately and enjoy! !